Home / appliances / samsung / tech / Be Summer Ready with Samsung Appliances. Be Summer Ready with Samsung Appliances. With temperatures that go up to 35°C during summer, it’s no surprise that most Filipinos would prefer to relax indoors once adventures under the sun are over. After travelling to and exploring new cities, being cooped up inside can seem less-than-thrilling, but, with the right appliances families can turn their homes into paradise. Samsung makes that possible by helping everyone score awesome appliances through their summer discounts of up to 20%. Have a cool summer at home without worrying about high electricity bills. With the help of Samsung Air Conditioner’s Digital 8-Pole Inverter Technology, your unit runs smoother and more efficiently even with the high summer temperature – giving you more energy savings. Feel as radiant as the sun with fresh and clean clothes all summer long with the Samsung Activ DualWash Washing Machine. Equipped with a bigger sink to pre-treat delicate and heavily soiled clothes, it gently and thoroughly cleans garments with its increased washing power. No longer worry about getting clothes dirty from stains and sweat this summer. The home wouldn’t be a paradise without delicious food. With the Samsung Smart Oven, which functions as a grill, steamer, fryer, and convection oven, families can invite friends over and easily come up with their own creative dishes any time. From baking pastries to creating homemade yogurt and even grilling steak, parents and their kids can choose from the 15 pre-set Cook with Ease menus and experience heaven at the comfort of their own home. from five freezer-fridge settings depending on the need. Enjoy summer at home with Samsung Digital Appliances. Don’t miss out on the chance to get these state-of-the-art home partners at up to 20% off today until June 30. 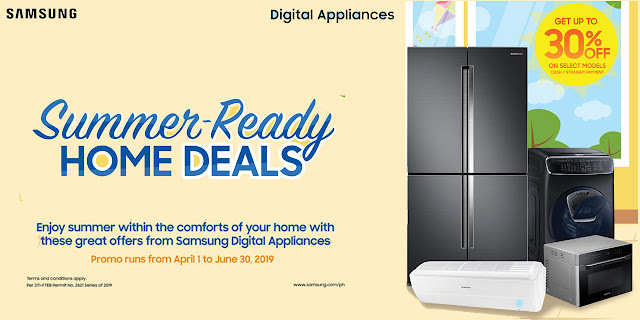 Head over to the nearest Samsung authorized dealer, check Samsung PH on Facebook, or visit www.samsung.com/ph/offer/summerreadyhomedeals for more information.